Five years after their original live-action Shazam! series, Filmation made a second attempt at the DC Comics-licensed superhero; however, this time they returned to more familiar territory by producing an animated series. 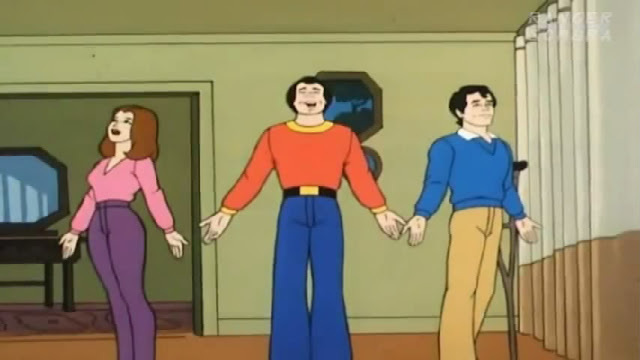 Mary, Billy and Freddy (top) say their magic words and transform into superheroes (bottom). 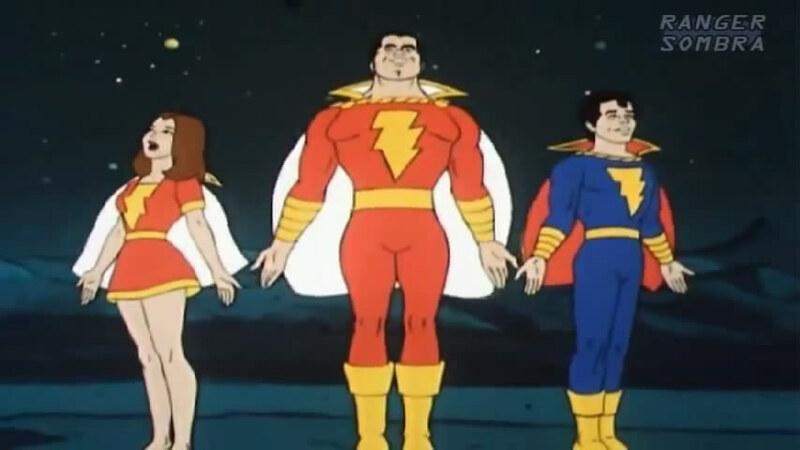 The animated Shazam! was a lot closer to the source material than the live-action one. Billy Batson (Burr Middleton) was a TV reporter (for WIZZ instead of WHIZ) who was imbued with the powers of the ancient wizard Shazam (Alan Oppenheimer) to continue on his quest of battling evil. By saying the wizard’s name, Billy was changed into Captain Marvel (also Middleton), who possessed the wisdom of Solomon, the strength of Hercules, the stamina of Atlas, the power of Zeus, the courage of Achilles and the speed of Mercury. Sharing in his adventures was Billy’s twin sister, Mary (Dawn Jeffory), who could transform into Mary Marvel with the grace of Selena, the strength of Hippolyta (not to be confused with Wonder Woman’s mother), the skill of Ariadne, the fleetness of Zephyrus, the beauty of Aurora, and the wisdom of Minerva, and disabled newspaper boy Freddy Freeman (Barry Gordon), who could become Captain Marvel Jr. (since he shared Captain Marvel’s powers, he used the hero’s name as his transformation word instead of “Shazam”). They lived in Fawcett City in the Marvel Mansion along with their Uncle Dudley (Oppenhimer, impersonating W.C. Fields), who sometimes tried to help out as the powerless Uncle Marvel. Also featured was the Marvels’ recurring friend, Tawky Tawny: a humanoid tiger who tried his best to be part of human society. The series made extensive use of the Marvel Family rogues gallery. 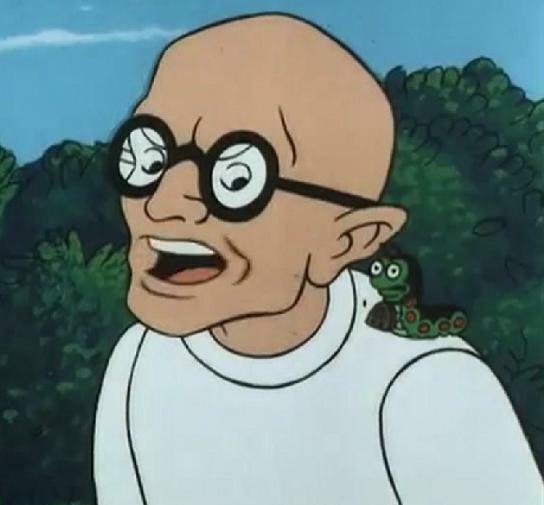 The most well-known amongst these were mad scientist Dr. Sivana; the genius alien worm Mr. Mind (both Oppenheimer); and Captain Marvel’s corrupted ancient predecessor Black Adam (Lou Scheimer). Other Marvel foes included were Night Owl (Scheimer), a daring thief whose oversized eyes gave him excellent night vision; Aunt Minerva (Jeffory), a sweet-looking old lady who was actually a criminal mastermind with designs on finding a new husband; Ibac (Scheimer), a muscular brute empowered by the strength of the four most evil men in history (Ivan the Terrible, Cesare Borgia, Attila the Hun and Caligula) who, in the cartoon, led an army of humanoid crocodile Hiss-Men; Dr. Allirog (Oppenheimer), an intelligent gorilla; and Mr. Atom, an artificially-intelligent nuclear-powered robot. Shazam! premiered on NBC on September 12, 1981 as part of The Kid Super Power Hour with Shazam. It was paired up with Filmation’s original creation Hero High, which was originally intended to feature superhero versions of Archie Comics characters before Filmation lost the license. Although Captain Marvel and Mary Marvel would appear in a couple of Hero High episodes, the Hero High cast was only featured in the 12th and final episode of Shazam!, which was written by Hero High writer Tom Ruegger. Otherwise, Shazam! was primarily written by Dennis O’Flaherty and Paul Dini, with a story and script by Fred Ladd. The series’ music was composed by Ray Ellis (as Yvette Blais) and producer Norm Prescott (as Jeff Michael). Prescott also served as the show’s narrator. Kevin Frank, Tim Gula, Mel Keefer and Janice Stocks served as the show’s character designers. Dr. Sivana and Mr. Mind often working together for evil! Only half as many Shazam! episodes were made in comparison to Hero High, resulting in the Shazam! feature being rerun alongside remaining new episodes of Hero High. And while Hero High saw release on DVD in 2007, Shazam! has yet to see a release beyond a series of VHS collections by Family Home Entertainment beginning in 1990. The following year, DC Comics would end its licensing agreement with CBS Publications, the then-current rights holder, and buy the characters outright. 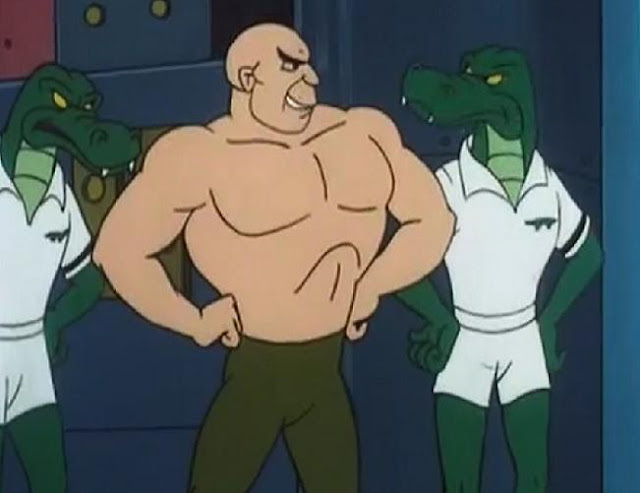 “Who’s Who at the Zoo?” (9/12/81) – Dr. Allirog allows himself to be taken in by the city zoo in order to enact his vengeance against the Marvel family. “The Incredible Sinking City” (9/19/81) – Tired of being ignored, Mr. Mind recruits an all-worm army to cause chaos and destruction in order to be named king of the world. “Best Seller” (9/26/81) – Ibac uses the Marvels’ cousin Freckles to entrap the Marvel Family in the past and turn them into part of his Hiss-Men army. “Flight 601 Has Vanished” (10/3/81) – The Marvels and Dr. Sivana end up flung into an alternate dimension where they end up the playthings of a giant girl. “Black Adam’s Return” (10/10/81) – Black Adam returns to resurrect Princess Jemia, but in failing that he takes Mary as a consolation prize. “A Menacing Family Affair” (10/17/81) – Dr. Sivana and his family are given an amulet that gives them powers on par with the Marvel Family. “Uncle Dudley’s Wedding Day” (10/24/81) – Aunt Minerva kidnaps Uncle Dudley to make him her husband. “The Airport Caper!” (11/7/81) – When Tawny fails to save animals abducted by Night Owl, it’s up to the Marvel Family to save them all. “Mr. Atom, the Smasher” (11/14/81) – After they stop his robot army, Mr. Atom captures the Marvels with a powerful electromagnet. “The Circus Plot” (11/21/81) – Mr. Tawny auditions for the circus while Mr. Mind concocts a worm-constructed grid that can harness the sun’s power into a powerful beam. “Star Master and the Solar Mirror” (11/28/81) – When Star Master captures Mary and Freddy, Captain Marvel has to go to Hero High to recruit some help in stopping him. Labels: 1980s, comic book, comic book adaptation, DC Comics, Filmation, Kid Superpower Hour, Shazam!